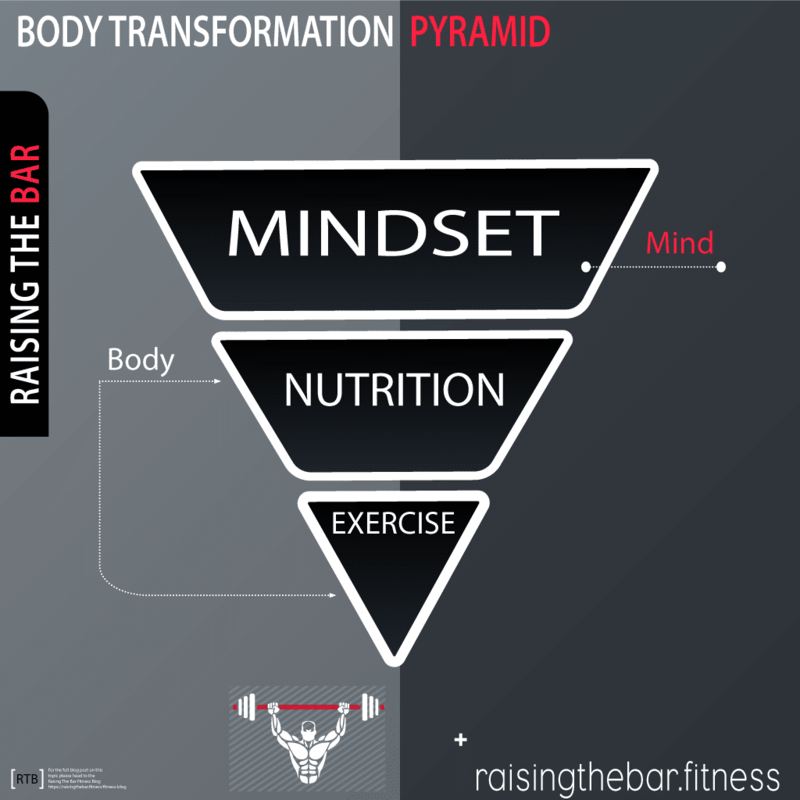 What is the Raising The Bar Body Transformation Pyramid of Success? 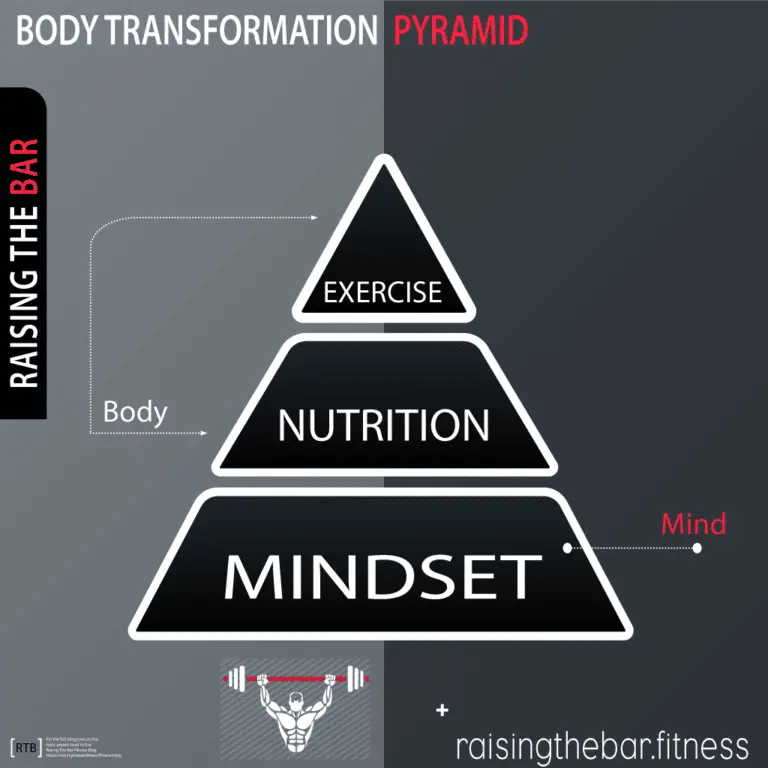 The Raising the Bar Body Transformation Pyramid of Success is a fitness concept depicting the hierarchy of what is needed to successfully transform your body, ensuring healthy, efficient and sustainable results. The body transformation pyramid was developed by personal trainer Finbar Harte based on my combined years of one to one personal training, online coaching and years of my own training and self-discipline. Early on as a one to one body transformation coach I quickly saw that the majority of clients were relying on and thought that the training element of a program ALONE would grant them the results they desired. They relied on me for the mindset and nutrition was just an afterthought or to much trouble to worry about. I wanted to create a visual representation depicting the importance of all three elements together but also showing the importance of each one for successful and long-term results. There are 3 essentials components needed in order to transform your body especially if you are new to healthy eating and physical exercise. This represents the mind element of the pyramid and is the most important element and therefore the foundation of the body transformation pyramid. You could have the best training and best nutritional program in the world but if you don’t have the willpower/mindset to follow it as laid out you will not gain the desired results. I will be writing posts on each one of these concepts, if you would like to read those posts then please subscribe to our mailing list so you know when they are live. Nutrition is the next element in the pyramid and the next most important element in transforming your body. This is the first of the two body elements as nutrition refers to everything you consume (add to your body) for energy to be able to perform everyday tasks and exercise efficiently. There are two reasons I put nutrition before exercise and why I believe it is a bigger factor in achieving long last body transformation success. 1) As previously stated what you consume gives you the energy and vitamins and minerals needed to perform exercise efficiently and sustain training sessions and overall health. 2) Exercise does burn fat and helps to shape your body, but as I am sure many of you are aware it is entirely possible to train regularly and still gain weight and fat. Your body needs to be in a calorie deficit in order to lose weight/fat if you are training regularly, not focusing on nutrition and without knowing in a calorie surplus it is very possible that although you are training you will gain weight and not reap the rewards you are trying to work towards. This, in turn, can leave you confused, demoralised, lead to excuse making and destruction of the foundation of the pyramid (mindset) to the extent that the pyramid will crumble and you give up altogether. The third and final element of the body transformation pyramid is exercise. Now don’t get me wrong looking at the pyramid you may think that I am not encouraging the exercise element of body transformation, but on the contrary, it is my favourite part. I want to drill home the point that each element on the pyramid is vital and all three are needed for a successful transformation, because exercise has the smallest proportion does not mean that you need to do less of it. All it means is that in terms of body transformation the more solid the bottom two elements of the pyramid the better the results you will achieve from the exercise part of your program. By creating a strong base you are setting yourself up for success. What is Meant by Body Transformation? Ok so I keep using the term “body transformation” as this term can be subjective I just want to give you an idea of what I am referring to when I use the term body transformation. Dramatic change – I am not taking small results but dramatic results will be different to each individual. Healthy sustainable methods – There is more than one way to achieve results but short term, quick results usually result in not being sustainable, the wrong metrics tracked resulting in negative body composition and even metabolic damage. Raising The Bar focuses on consistent gradual improvement. Shortest time possible – Now I put this after healthy sustainable methods on purpose because transforming you body correctly using consistent, gradual results will make it take slightly longer. We are still aiming for the shortest time possible but using the right methods. You need to be aware that body transformation takes time (dependent on many variable factors). But I can tell you it is going to take months. What Type of Exercise is The Pyramid Referring to? The exercise element in the body transformation pyramid refers to any movement which uses exertion, effort or requires work. So basically any form of exercise that starts a sweat, burns calories and pushes you out of your comfort zone. This is where having a structured plan and a coach or a trainer can be vital. You need to be pushed or push yourself but you also need to know what form of exercise and way to perform it is going to maximize your results. It is all too common where someone starts on the journey of transforming their bodies and change how they eat and start exercising. At the start, they get results but then they soon plateau and get stuck in a rut not seeing any more progress which often leads to quitting when all is needed is some small tweaks and changes to keep the results coming. As stated in the introduction one limiting factors I saw over and over again from years of personal training was the belief that exercise alone would be enough to make a successful body transformation. I am not saying that you cant make positive health, fitness and physical changes with exercise alone because you 100% can. But to make big long-lasting changes to your physic takes a lot of time a lot of effort and you won’t get there from exercise alone. You have probably heard expressions like the one above used in the fitness industry and although these figures aren’t an exact science, expression like these are used to highlight the fact nutrition (I hate the word diet) has a greater role to play than exercise in burning fat and gaining muscle “you can’t out train a bad diet”. The 70/30 rule from my experience this ratio is about right the body transformation pyramid just adds another vital element, mindset. Mindset is what you need to make these changes, implement them and consistently stick to them. Using the 70/30 rule by relying on exercise alone you can only obtain 30% of the results and that is if you have the mindset to keep going. You are essentially leaving 70% of the achievable results on the table. By using the pyramid we can show what it is like by relying on exercise alone by turning it upside down. Regardless if you focus on nutrition and mindset or not by turning it upside (relying only on exercise) it has the same effect. Your whole transformation is balancing on an unstable point and all it takes is a small tip in either direction for the whole thing to come crashing down. People often say to me if its 70% nutrition and 30% exercise then there is nothing left for mindset? The body transformation pyramid is taking two factors into account, body and mind. Body including nutrition and exercise 70/30 and mind is mindset 100%. “70% Nutrition 30% Exercise 100% Focus or effort or determination etc” there are actually many different words or expressions we could use or are already used to get across the idea of mindset and all apply because all of them are elements of what mindset actually incorporates. It is such a large and vital component of everything which is why is the foundation of the pyramid and of your body transformation. Eating disorders, making the decision to change your body, choice over whether you exercise or not, choice over what you eat, determination to follow a plan 100%, getting out of the bed in the morning. These are all elements of mindset and when we look at everything it encompasses it is ludicrous to then think that we can make long-lasting changes to our body without focusing on the mind.